Not only is it breezy to wear, it was a breeze to make! I simply roll hemmed a strip of Pastry Line in magenta and sewed it to a rectangle of Coloring Garden in dusk. Then I hemmed some thin lining fabric to be the same length as the Coloring Garden portion. If you want a poofier skirt, you could leave the rectangles alone, but I wanted mine to be a bit more form fitting, so I cut two a-line shaped pieces out of the voile and lining, sewed them all together at the side seams, and shirred about 8 rows all around the top. At the very top of the waistband, I made a casing and inserted 1/4 inch elastic to keep it from puckering. You could leave out the elastic and have a cute design feature though. That’s it! So easy, and with less than half a yard of my main fabric, an economical use of that precious voile too! I love how it looks with a wide belt over the shirring. Cute! 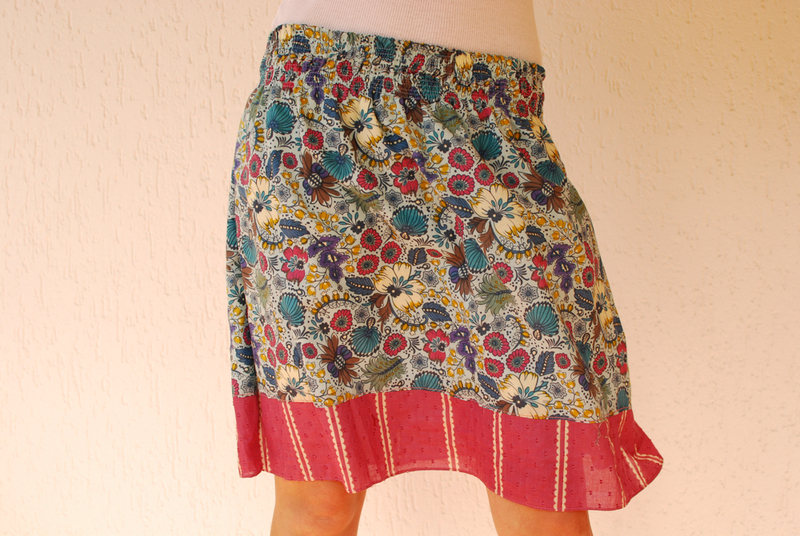 I love the colours of AnneMaria’s voile, very pretty. I have no idea if I can get it around here, but I’ll sure be looking for it! Thanks so much Adrianna! I love your skirt!!! Cute as always!!! I have been thinking of making a skirt just like this…jsut haven’t :) Now to decide if I want to use the a-line or the fuller version! So excited! Thank you so much :) Adrianna I feel the same way when I wear my skirt/dress, I am constantly checking making sure all my merchandise in covered. ;) Love love love this fabric, is fabulous! Your all adorable! But especially you last two lovely ladies! You look so cute in your skirts! 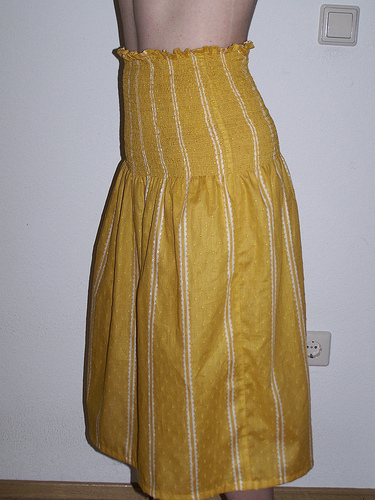 I absolutely love the skirt – it’s wonderful…although it does little to dampen my current shirring addiction. I’ve just done my first bit of shirring and enjoyed it SO much. 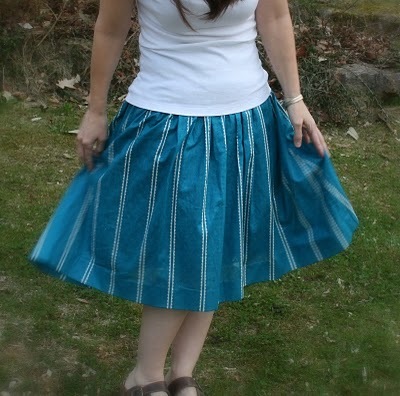 Your skirt is gorgeous, I may have to treat myself to making yet another item of Summer clothing! Love the skirt!! What did you line it with?